When searching for a Moustache Mug or Cup whether on ebay or the web, you’re generally confronted not with a real Moustache Cup or Mug, but novelty mugs with pictures of moustaches on them. (Almost as bad are the more modern mugs with pictures of fake old cars, guys with moustaches or fake old locomotives around the outside.) For those of us with real moustaches who would like to keep our 'staches clean and dry, moustache mugs or cups with pictures of moustaches or anything else printed on them are a joke. A REAL Moustache Mug or Cup is designed with a dam across the top of the mug upon which your moustache rests. There is a hole in the dam that permits the liquid in the vessel to be sipped while your 'stach remains clean and dry on the dam (see the picture showing an example). Cups like these were quite readily available as late as the 1920’s- 1930’s but as ‘staches went out of style the cups pretty much disappeared along with moustache spoons and portable moustache dams. What was available were the “antique” cups which were generally more like teacups than coffee cups and really too small to be useful these days. What I’m selling here are moustache mugs, moustache cups and moustache beer mugs that are convenient, attractive (no stupid pictures on ther outside!!) And most of all, useful and practical. We offer three different styles/sizes of moustache cups in both right and left handed types and you can get an idea of their relative size from the picture on the left. On the far left, is the Moustache Beer Mug. This mug holds a full 24 ounces ( will hold ½ liter bottles as well as 650 ml bottles of beer) and will keep that ‘stache high and dry! In the middle is our standard Moustache Cup which holds about 12 ounces and is the perfect coffee cup/mug to use throughout the day at home or in the office. On the right is the smaller Moustache Coffee Cup which holds about 8 ounces and is at home on the breakfast, lunch or dinner table without being too obtrusive. It’s an elegant and attractive cup. 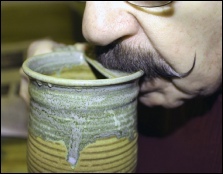 All of our Mustache Cups are handmade for us here in the US by a small independent pottery. Because each cup is individually thrown, they are not exactly alike b ut are certainly very similar. Making the cups and mugs is a really time consuming affair and requires many processes which include, throwing the cup, then trimming and applying handles and the ‘stache dam, then the “bisque” firing at a temperature of about 1700 degrees followed by glazing, drying and a final slow firing at 2300 degrees. The whole process takes almost a month and because of that, I have a limited number of cups and mugs to sell. Our Moustache Cups (and Moustache Mugs as well) are oven and microwave safe, dishwasher safe, and lead free. I think they’re really attractive and if you have a moustache are really practical! Here’s a picture of Yours Truly using one of Harry’s Moustache Cups. You can see how the ‘stache rests nicely on the dam keeping it clean and dry. It’s late in the day and I’m using #26 wax. It was about 6PM and as you can see it had not begun to droop. We have three styles of Moustache Cup available currently. 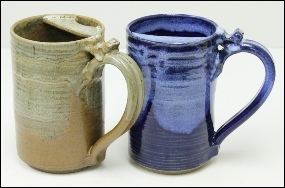 The most popular is the Standard Mug style shown to the left. It’s available in both right and left hand and in four different colors. It holds a full 12 ounces, it’s comfortable and keeps the ‘stache high and dry. The available colors are (top row) Light Brown, Stone Blue, (bottom row) Cobalt Blue and Dark Mocha. We’ve sold hundreds with nary a complaint or return. I use it at home and it’s my favorite. 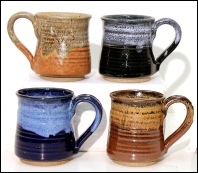 The Beer Mug shown to the right also comes in right and left hand types and is available in two colors, Light Brown and Cobalt Blue. It stands about 6” tall and is about 3.75” in diameter. A really proper Beer Mug! If you have a ‘stache and drink beer, it’s a must have if you’re to keep that ’stache dry and clean. Our Moustache Beer Mugs will hold about 24 ounces, a really practical size for beer drinking as well as soft drinks with ice. The moustache dam keeps liquid from messing up your ‘stache and with soft drinks, keeps the ice away from banging against your lip. The Moustache Dinner Cups (on the left) are available in right and left hand and in two colors., Celedon and Cobalt Blue. Considerably more elegant than the other two styles they hold about 8 ounces and will look good on any table and because of their size, they look good in any setting whether it’s lunch or dinner, formal or informal. If you have friends (with moustaches) visiting for dinner this is the perfect cup to end the meal with.